Description: Adult carrion crows appear black although their plumage has a green and purple iridescence. They have dark brown eyes. Juvenile carrion crows are a duller brown with pale blue eyes. Nesting: Carrion crows build their nests in the forks of a tree, on cliff edges or even in electricity pylons. Both birds build the large nests from twigs lined with hair and bark. They lay 4-7 smooth, glossy blue-green eggs with dark brown markings which are incubated by the female for 18-20 days. Both sexes feed the baby birds which fledge at 28-35 days. 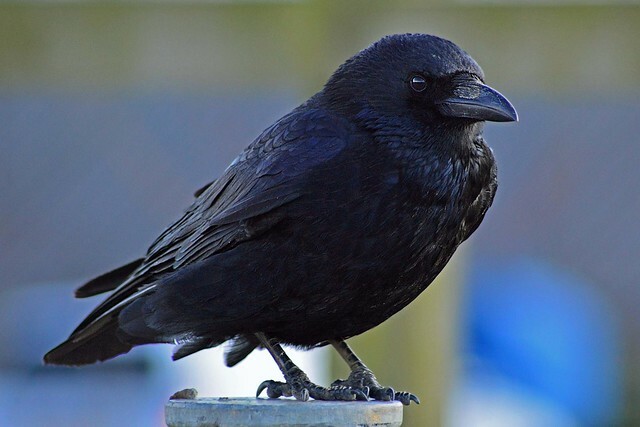 Feeding: Carrion crows have a varied diet and will eat insects, worms, berries, birds’ eggs and chicks, small mammals, snakes, frogs and discarded food. They have even been known to eat human vomit. Where to see them: Carrion crows are found all over the UK except for the north and west of Scotland and Northern Ireland. Did you know? Crows are highly intelligent and have a sophisticated form of language including regional dialects.